Special Containment Procedures: SCP-678 is to be contained in a secure lockbox on-site in a container rated for security against at least Level 2 attempted containment breaches. Guards posted to guard SCP-678 should not be aware of what they are guarding, as recovery attempts are a risk. SCP-678 poses no recognized threat of escape at this time, but if the container is ruptured or SCP-678 removed for any reason, no personnel are to make unshielded contact with SCP-678. 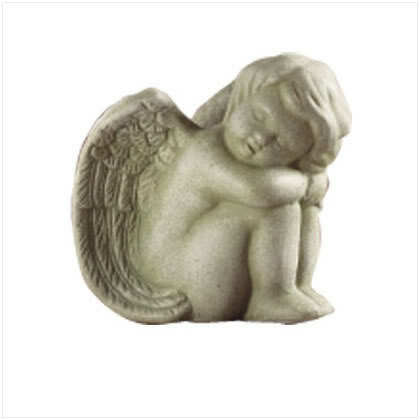 Description: SCP-678 is a small statuette of a sleeping angel, that displays no unusual characteristics under visual inspection. Upon unshielded physical contact with SCP-678, however, SCP-678 excises highly traumatic events from the subject's memory immediately, leaving a blank period in the subject's recollections of the past. This function is currently being evaluated for use as a new grade of amnestic, but the further effects of SCP-678 render it unsuitable for use at this time. The process of memory removal utilized by SCP-678 is damaging to the subject, however, and in the week following contact with SCP-678, the subject's mind continues to erode. This erosion does not stop, but reaches a critical point at any time from six to nine days after initial contact when the autonomous capabilities of the brain to regulate heartbeat, breathing, and other homeostatic effects is eradicated. At this point, the subject typically dies of asphyxiation. Autopsy reveals no physical damage to the brain, and the method utilized by SCP-678 is currently unknown. After an event such as this, SCP-678 alters shape, the statuette shifting to a standing position with its eyes open and teeth clenched. The next unshielded contact with SCP-678 will cause the transference of the memories initially erased to the subject currently touching SCP-678, and SCP-678 will revert to its standard form. Subjects interviewed during the decay process describe themselves as fearful, but cannot identify the source of the fear. As their personal sense of identity disintegrates, they continue to voice a nameless terror as long as they retain the capability of speech, which is gone by the second to third day. Those informed of their impending death seem unconcerned by it, if they understand at all, instead continuing to complain of a 'problem' that they can't figure out. Staff psychologists suspect this communication issue is due to both the subject's loss of mental faculties combined with an inability to easily express the ongoing nature of the damage to the subject. After the subject's capability of speech is gone, they typically retreat to a corner when permitted to do so, clawing at their head intermittently for approximately a day before lapsing into a coma until their death. SCP-678 was taken from a Mr. ████ ██████████ upon his apprehension by Foundation personnel. ██████████ was a "travelling chaplain" who was visiting Veteran's Administration hospitals across the eastern United States and offering counselling to any willing to speak to him. During these counselling sessions, he would encourage the subject in any of a variety of ways to come into contact with SCP-678, an item which he only handled with a pair of gloves he wore specifically for this purpose. ██████████ would wrap up his counselling session shortly afterwards and leave the hospital. Interrogation reports indicate that ██████████, a citizen of Belgium and suspected patron of Marshall, Carter, and Dark Ltd., appears to have been using the device to harvest these 'experiences' for personal amusement. ██████████ has been remanded to Psychological Ward 14 for evaluation, his termination pending background check and review of possible value to the Foundation as a bargaining tool.